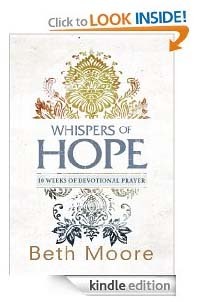 Whispers of Hope by Beth Moore led me to one conclusion: each day is an answer. And, in 70 days, you will have mastered her personalized algorithm of praying to Him if you can commit just a half an hour each time. Using her P.R.A.I.S.E. format, Beth Moore successfully portrays a tangible method of reaching your prayer goals that perhaps you have found difficult to meet, whether because you could not find the time, method or simply felt disconnected. Through excitement and direction, you will be guided through praise, repentance, acknowledgement, intercession, supplication, and equipping. It matters not your denomination: I found this to be indisputably filled with the love of Christ. The introduction just takes minutes to read through, and you are well on your way to starting day number one. Each day gives you a unique Scripture reading followed by relevant thoughts for the day. Then, you have a creative space to jot down what comes to mind and reflect through Beth Moore’s powerful format. In these times we find ourselves in, prayer is our best friend. It guides us when we are lost. It re-centers us when we feel to be on the brink of defeat. The secular world makes it challenging to focus on Him during silence and we may find thoughts racing through our minds, but works such as Whispers of Hope by Beth Moore is exactly what we need to know that Christ is reachable within a few minutes of our time.